Family House is a 501(c) (3) not-for-profit organization providing temporary housing to families of seriously ill children receiving treatment at the University of California San Francisco Benioff Children's Hospital. Qualifying families live more than 50 miles from UCSF, and many live at or below the low-income status as determined by UCSF. Our location sustains nearly a 100% occupancy rate and can accommodate 250 people per night. Over the course of a year we serve more than 4,000 families. 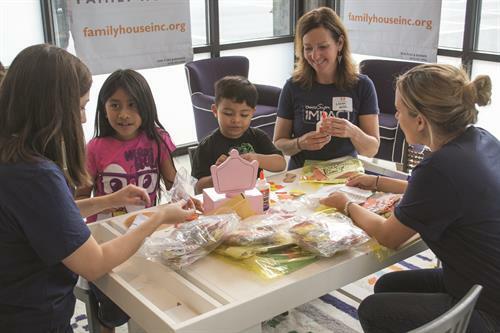 Family House is an independent organization led by a professional staff and board of directors dedicated to providing residential services free-of-charge to qualifying families. Since we receive no financial support from UCSF, or any other public entity, we rely solely on the generous contributions of individuals, corporations and foundations. Located on Mission Bay Blvd North at 3rd Street - 2 blocks south of Oracle Park and 2 blocks north of the UCSF Benioff Children's Hospital.